After just one year of fundraising, Riverside Minor Baseball is breaking ground on a new Miracle League baseball diamond in east Windsor. A sod turning ceremony was held Wednesday morning to mark the official start of construction. 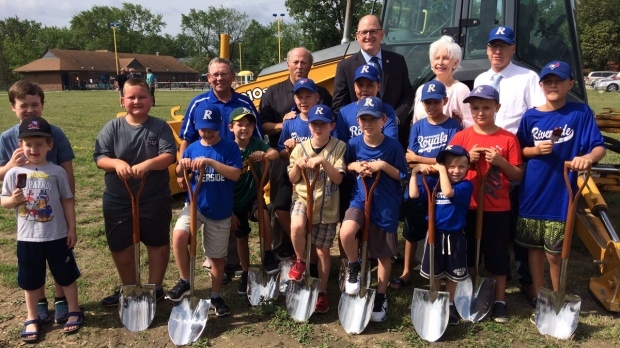 The field, next to the existing Riverside baseball diamonds on Wyandotte Street East, will allow children with disabilities to participate in minor baseball programs. The Farrow Riverside Miracle Field is modeled after the existing one in Amherstburg. The diamond is part of a $2.5-million project on property leased from the city last October. So far, $2.2-million has been collected by fundraisers. Plans for the site include a fully accessible inclusive playground, a walking path and the relocation of a cenotaph. Construction should be complete sometime this fall.